The optimal solutions obtained by flux balance analysis (FBA) are typically not unique. Flux modules have recently been shown to be a very useful tool to simplify and decompose the space of FBA-optimal solutions. Since yield-maximization is sometimes not the primary objective encountered in vivo, we are also interested in understanding the space of sub-optimal solutions. Unfortunately, the flux modules are too restrictive and not suited for this task. We present a generalization, called k-module, which compensates the limited applicability of flux modules to the space of sub-optimal solutions. Intuitively, a k-module is a sub-network with low connectivity to the rest of the network. Recursive application of k-modules yields a hierarchical decomposition of the metabolic network, which is also known as branch decomposition in matroid theory. In particular, decompositions computed by existing methods, like the null-space-based approach, introduced by Poolman et al. [(2007) J. Theor. Biol. 249, 691–705] can be interpreted as branch decompositions. With k-modules we can now compare alternative decompositions of metabolic networks to the classical sub-systems of glycolysis, tricarboxylic acid (TCA) cycle, etc. 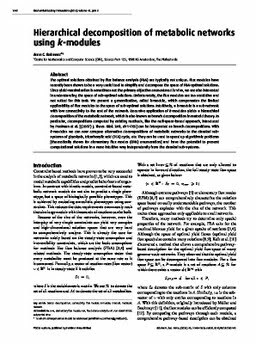 They can be used to speed up algorithmic problems [theoretically shown for elementary flux modes (EFM) enumeration] and have the potential to present computational solutions in a more intuitive way independently from the classical sub-systems.